In this week's edition of Twice Told Tuesday, Shades reprinted an article about a project commenced by the Dundee Photographic Society to carry out a comprehensive photographic survey of that Scottish city. The purpose was to illustrate life in the city in 1903, a permanent record for generations to come. It was a time consuming and expensive project for the time. Looking around at my small town, Preston, Washington, I realized there is no photographic survey illustrating life here to leave a permanent record for generations to come. What a terrible shame that is, with digital cameras and blogs the cost to recreate such a project today is made up of time and sweat equity, very little money. We take our daily lives for granted. Nothing really happens, we think, so who would be interested? Will the generations that follow want to know what Preston, Washington's, or Anyplace, USA's, daily life looked like? I believe they will. Just as we search for a glimpse of our ancestor's daily lives, a hundred years from now someone, someplace, will search for ours. Here in Preston, Washington, we are leaving a terrible void and I would like to change that. If you live in a large city, taking on a photographic survey of the entire city would require many hands and many cameras, but you could certainly document your community within that city. What would your photographic survey contain? I have gotten a map of Preston and am marking the areas of daily community life. I intend to start that photographic survey, today - here. I will include buildings, churches, businesses, signs, street scenes, anything that will illustrate daily life in the Preston of 2008. I will continually add to that survey. Generations to come will have an accurate photographic history of my little corner of the world. 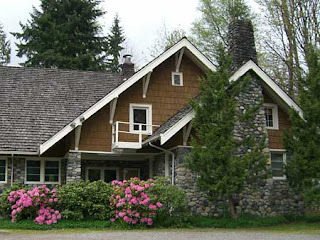 Preston, Washington, was originally called St. Louis (1896) and was later named Preston for William T. Preston, an engineer who had surveyed the right-of-way through the area for the short-lived Seattle, Lakeshore and Eastern Railroad. Preston is located in a bowl with hills on all sides and the Raging River running along the valley floor. While alternately referred to as the "Ranging Trickle," the river has more than earned its "Raging" title. The town was established around the Preston Mill, owned by a Swedish immigrant named August Lovegren. On the street where I live is Preston's Vasa Hall. 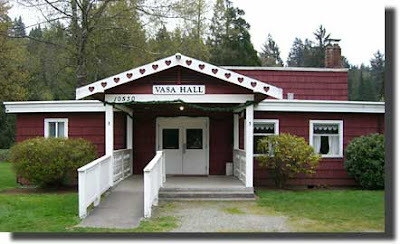 Vasa Hall is a Swedish social gathering place and home of our local Swedish Meatball Feast. Parking is at a premium on my street on Feast Day. People come from miles around to sample the Swedish meatballs. Down the road, over the Raging River, and through the woods is the Preston Baptist Church. 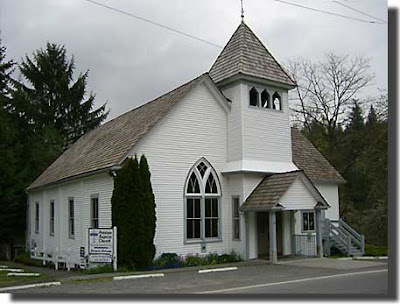 The church was established in 1900 on land donated by August Lovegren. Lovegren envisioned a model community guided by Baptist principles. 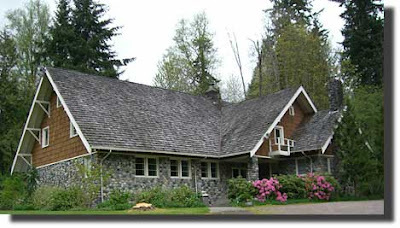 Part of the King County Parks system, the Preston Community Center is a historic log building, surrounded by a small park. The Center is home to the Preston Community Club which is dedicated to advancing and protecting the rural atmosphere of our small town. 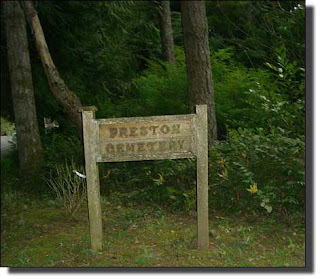 The Historic Preston Cemetery is located at Latitude: 47.525N Longitude: -121.929W. 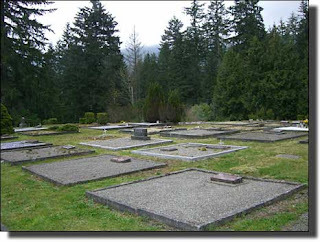 A transcription of the cemetery has been completed, but it is in need of a photographic survey. Thanks to Terry Thornton's Friday From The Collectors article, A Monumental Task, I will undertake this survey (Once it stops raining - rain is a way of life here in Preston. Washington state is known for its hundred shades of green, that require a hundred shades of gray). So, tell me, are you up to the task? Is there a Photographic Survey of your hometown in your future? If you do commence such a survey, please contact me so that I can list all the surveys in progress for future generations. 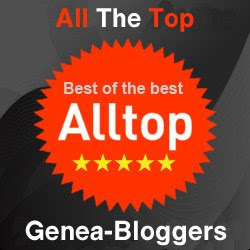 MAVEN, I do like this idea! Are you proposing a look at your community through "rose-colored" glasses or, are you going to show warts and all? I've wished for the courage to undertake such a photographic record of some of the rural roads in the Hill Country --- but haven't had the courage to start photographing houses and structures. What do you know about such? Do you think privately owned buildings/houses can be photographed and published (photos taken only from the public road-ways, of course) without a release from the owners? I enjoyed your your first photographs from Preston --- and I commend you for taking on such an interesting and needed project. If you have thoughts about doing such a photographic survey in a rural setting, please let me know. I am very much interested in recording in photographs the buildings and houses along Hatley-Detroit Road in Monroe County, Mississippi. I think that's a great idea, and I loved your photos. I've had that thought every time I go "home" and lament some new shopping center being built or something else torn down. I can't tell you how many times my parents said they wished they had taken photos of the neighborhood because it has changed so much over the years. This summer I hope to have some fun with my new fancy camera and document the parts of Philadelphia where I grew up and where I work, and the small town in New Jersey where I now live. I love looking at "then - now" photos (as you could tell in my recent post on the Bavarian town. But if no one takes a "now" photo it can never become a "then" photo in the future! Old memories of home prompted Dad to share family history stories, so I made it a point of taking my digital voice recorder on our almost daily car jaunts here and there throughout the greater-Seattle area. I think back now and recall Dad and our step-mom Blanche singing "Down by the Old Mill Stream" and "You are my Sunshine" in the back seat at the top of their elderly voices, with me chiming in with a weak alto harmony in the driver's seat. Those were the days -- remembering the good ol' days with them. I agree with Donna that even in Ol' Myrt's 58-year-old lifetime, many of the old places I grew up with have been razed for shopping malls, fast food chains and gas stations. My own Laurelhurst Elementary School in Seattle is practically in ruins, but the old wooden portables in the NE playground are still there -- apparently continuing to accommodate a burgeoning student population. I have thought about doing this very thing a number of times over the years. However, my community of 100,000+ people is just too big an undertaking for me. I fear I'd get bored with the project before I finished. We don't have quaint or historic buildings like you have... I live in a suburb of of mega-malls and super highways that criss cross the city. However, I have made a point of taking pictures of the strip malls and intersections near our house, as well as my kids' schools, the city hall, etc. And I am seriously considering making a project of photographing the beautiful 18 mile long Hines Drive near our house. It's a parkway with a stream, lake, multiple picnic areas, sledding in winter, disc golf in the summer, etc. Now that's a project I could get excited about. I'm not sure how much it would change over time though. It hasn't changed much in the 50+ years of my life.